This plot shows the Doppler effects on a stable carrier received at a distance of about 50km. The trace at 698Hz is a reference signal and is not part of the plot. At the start of the plot the band is closed. It opens just before 0800 with both the ordinary and extraordinary waves coming in a few minutes apart. 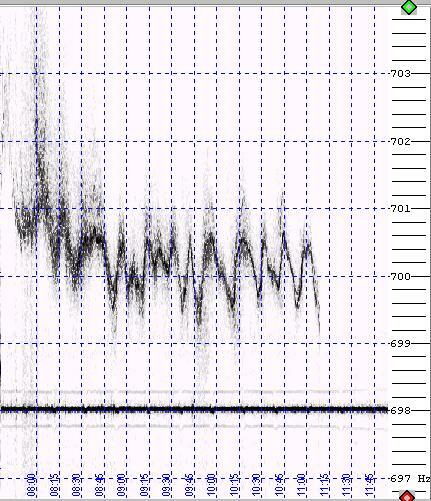 At this time the Doppler shift is very large -peaking nearly 2Hz (the correct centre frequency for this carrier is 700Hz). The Doppler shift reduces and the signal strengthens until the transmitter is switched off at 1107. 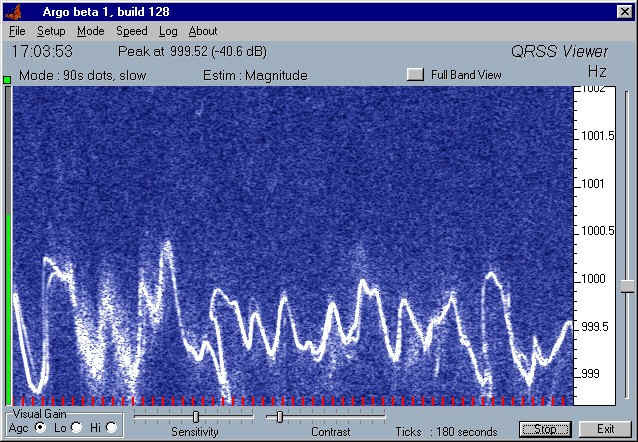 By this time the signal has stabilised to show a periodic oscillation of about plus or minus 600mHz about the centre frequency. 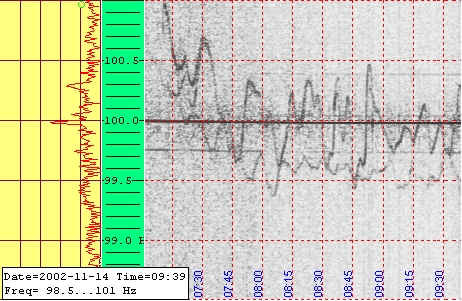 These oscillations are caused by acoustic gravity waves in the atmosphere. They are naturally occurring phenomena and can be stimulated by large events in the troposphere such as thunderstorms. The slight "fizzing" or grey areas are commonly observed on this type of plot. there origin is uncertain but may be caused by irregularities in the E layer. This plot was done by Graham Beesley, M0GEB and shows up a phenomena called a switchback. This is above the "y" in sensitivity and is caused by a small radius curvature concave structure in the F layer. 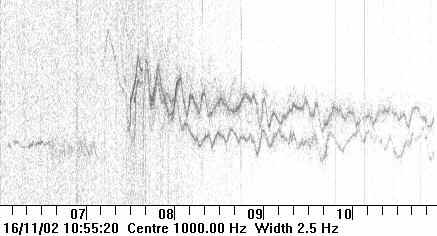 Interestingly here the signal used by Graham is the 5 MHz harmonic of a mediumwave broadcast transmitter. This plot done by Peter G3PLX shows some interesting returns before the band opens properly at 0710. They may well be night-time Es. After 0730, two distinctly different traces are seen. They are unlikely to be the o and x waves of one transmitter and, since they are observed on a mediumwave harmonic frequency, are probably two transmitters. The high degree of correlation in the plots is interesting and suggests that two transmitters on the same frequency are geographically close to each other - which seems odd. 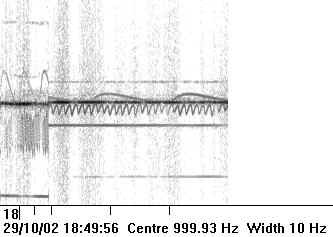 Paul G0HNW's plot of mediumwave harmonics shows several transmitters together with some "disappearing groundwave". The mechanism here is unknown. Peter G3PLX's plot of G0HNW shows a lot of "fizzing". At the start. the o and x waves can be seen fairly clearly. This is a fun plot done at 648kHz. The regular oscillations are different temperature controlled standards on broadcast TXs. This plot done by Peter shows the two components (o and x) very clearly on a super stable signal transmitted by me.